Rosalyn Sussman Yalow (July 19, 1921 – May 30, 2011) was an American medical physicist, and a co-winner of the 1977 Nobel Prize in Physiology or Medicine (together with Roger Guillemin and Andrew Schally) for development of the radioimmunoassay (RIA) technique. She was the second woman (the first being Gerty Cori), and the first American-born woman, to be awarded the Nobel Prize in physiology or medicine. Rosalyn Sussman Yalow was born in the Bronx, New York, the daughter of Clara (née Zipper) and Simon Sussman, and was raised in a Jewish household. She went to Walton High School (Bronx), New York City. After high school, she attended the all-female, tuition-free Hunter College, where her mother hoped she would learn to become a teacher. Instead, Yalow decided to study physics. I was excited about achieving a career in physics. My family, being more practical, thought the most desirable position for me would be as an elementary school teacher. Yalow knew how to type, and was able to get a part-time position as a secretary to Dr. Rudolf Schoenheimer, a leading biochemist at Columbia University's College of Physicians and Surgeons. She did not believe that any respectable graduate school would admit and financially support a woman, so she took another job as a secretary to Michael Heidelberger, another biochemist at Columbia, who hired her on the condition that she studied stenography. She graduated from Hunter College in January 1941. A few years later, she received an offer to be a teaching assistant in physics at the University of Illinois at Urbana-Champaign. She received this offer partially because World War II had just begun and many men went off to fight, and the University opted to offer women scholarship to avoid being shut down. At the University of Illinois at Urbana-Champaign, she was the only woman among the department's 400 members, and the first since 1917.:109 Yalow earned her Ph.D. in 1945. The next summer, she took two tuition-free physics courses under government auspices at New York University. She married fellow student Aaron Yalow, the son of a rabbi, in June 1943. They had two children, Benjamin and Elanna Yalow, and kept a kosher home. Yalow did not believe in "balancing her career with her home life" and instead incorporated her home life wherever she could in her work life. :109 Yalow did, however, viewed the traditional roles of a homemaker as a priority, and devoted herself to traditional duties associated with motherhood and being a wife. The month after graduating from Hunter College in January 1941, Rosalyn Sussman Yalow was offered a teaching assistantship in the physics department of the University of Illinois at Urbana-Champaign. Gaining acceptance to the physics graduate program in the College of Engineering at the University of Illinois was one of the many hurdles she had to overcome as a woman in her field. Powerful male figures controlled opportunities for training, recognition, promotion, and many aspects of development in the field of science, and especially physics. When Yalow entered the university in September 1941, she was the only woman in the faculty, which comprised 400 professors and teaching assistants. She was the first woman in more than two decades to attend or teach at this engineering college. Yalow credited her position at the prestigious graduate school to the shortage of male candidates during World War II. Being surrounded by gifted men made her aware of a wider world in science. They recognized her talent, they encouraged her, and they supported her. They were in a position to help her succeed. Yalow felt that other women in her field did not like her because of her ambition. Other women saw her curiosity as abandoning the only acceptable path for a woman in science at the time, becoming a high school science teacher, but Yalow wanted to be a physicist. During her time at the University of Illinois, she took extra undergraduate courses to increase her knowledge because she wanted to do original experimental research in addition to her regular teaching duties. Yalow's first job after teaching and taking classes at the University of Illinois at Champaign-Urbana graduate school was as an assistant electrical engineer at Federal Telecommunications Laboratory. She, again, found herself to be the only woman employee. In 1946, she returned to Hunter College to teach physics and consequently influenced many women, most notably a young Mildred Dresselhaus: Yalow was responsible for steering the future "Queen of Carbon Science" away from primary school teaching and into a research career. She remained a physics lecturer from 1946 to 1950, although by 1947, she began her long association with the Veterans Administration (VA) by becoming a consultant to the Bronx VA Hospital. The VA wanted to establish research programs to explore medical uses of radioactive substances. By 1950, Yalow had equipped a radioisotope laboratory at the Bronx VA Hospital and decided to leave teaching to finally devote her attention to full-time research. There she collaborated with Solomon Berson to develop radioimmunoassay (RIA), a radioisotope tracing technique that allows the measurement of tiny quantities of various biological substances in human blood as well as a multitude of other aqueous fluids. Originally used to study insulin levels in diabetes mellitus, the technique has since been applied to hundreds of other substances – including hormones, vitamins and enzymes – all too small to detect previously. Despite its huge commercial potential, Yalow and Berson refused to patent the method. In 1968, Yalow was appointed Research Professor in the Department of Medicine at Mount Sinai Hospital, where she later became the Solomon Berson Distinguished Professor at Large. Yalow was awarded a Fulbright fellowship to Portugal, which is an American scholarship program of competitive, merit-based grants that sponsor participants for exchanges in all areas of endeavor, including the sciences, business, academe, public service, government and the arts. In 1961, Yalow won the Eli Lilly Award of the American Diabetes Association, which provides scholarships for up to 100 scholars to attend Scientific Sessions, the world's largest scientific and medical conference focused on diabetes and its complications. Additionally, it provides the education and training for these scholars to serve as faculty for professional education programs and to clinically manage the disease. A year later, she was awarded the Gairdner Foundation International Award, which recognizes the world's most creative and accomplished biomedical scientists who are advancing humanity. The same year, Yalow was awarded the American College of Physicians Award, which recognizes excellence and distinguished contributions by individuals to internal medicine. 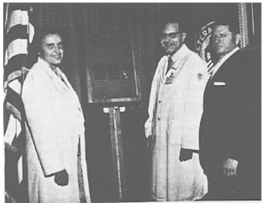 In 1972, Yalow was awarded the William S. Middleton Award for Excellence in Research, which is the highest honor awarded annually by the Biomedical Laboratory Research and Development Service to senior bio biomedical research scientists in recognition of their outstanding scientific contributions and achievements, pertaining to the healthcare of Veterans. Also in 1972, she was given the Koch Award of the Endocrine Society, which awards individuals for their dedication to excellence in research, education and clinical practice in the field of endocrinology. In 1975, Yalow and Berson (who had died in 1972) were awarded the American Medical Association Scientific Achievement Award, which is a gold medallion award presented to individuals on special occasions in recognition of their outstanding work in scientific achievement. The following year she became the first female recipient and first nuclear physicist of the Albert Lasker Award for Basic Medical Research. Established by Albert and Mary Lasker in 1945, the award is intended to celebrate scientists who have made fundamental biological discoveries and clinical advances that improve human health. In 1977, Yalow was the sixth individual woman (seventh overall, considering Marie Curie's two wins), and first American-born woman, to win the Nobel Prize in a scientific field. She was also the second woman in the world to win in the physiology or medicine category (the first being Gerty Cori). She was so honored, together with Roger Guillemin and Andrew V. Schally, for her role in devising the radioimmunoassay (RIA) technique. By measuring substances in the human body, the screening of the blood of donors for such diseases as hepatitis was made possible. Radioimmunoassay (RIA) can be used to measure a multitude of substances found in tiny quantities in fluids within and outside of organisms (such as viruses, drugs and hormones). The list of current possible uses is endless, but specifically, RIA allows blood-donations to be screened for various types of hepatitis. The technique can also be used to identify hormone-related health problems. Further, RIA can be used to detect in the blood many foreign substances including some cancers. Finally, the technique can be used to measure the effectiveness of dose levels of antibiotics and drugs. In 1978, Yalow was elected a Fellow of the American Academy of Arts and Sciences, which provides an opportunity for an early-career professional with training in science or engineering to learn about a career in public policy and administration. In 1986, Yalow was awarded the A. Cressy Morrison Award in Natural Sciences of the N.Y. Academy of Sciences, which is offered by Mr. Abraham Cressy Morrison to individuals with superlative papers on a scientific subject within the field of The New York Academy of Sciences and its Affiliated Societies. In 1988, Yalow received the National Medal of Science, which is given to American individuals who deserve the highest honor in science and technology. In 1993, Yalow was inducted into the National Women's Hall of Fame. ^ Glick, S. (2011). "Rosalyn Sussman Yalow (1921–2011) The second woman to win the Nobel prize in medicine". Nature. 474 (7353): 580. doi:10.1038/474580a. PMID 21720355. ^ MIT News Office (21 February 2017). "Institute Professor Emerita Mildred Dresselhaus, a pioneer in the electronic properties of materials, dies at 86". MIT News. Retrieved 21 February 2017. ^ Bonolis, Luisa. "Research Profile – Rosalyn Yalow". Lindau Nobel Laureate Meetings. Retrieved 31 August 2018. ^ a b Yalow, Rosalyn (1977). "Autobiography". Nobelprize.org. Retrieved October 2, 2012. ^ a b c d e f g h i Straus, Eugene (1999). Rosalyn Yalow, Nobel Laureate: Her Life and Work in Medicine. Cambridge, MA: Perseus Books. ISBN 978-0738202631. ^ a b Kahn, C. Ronald; Roth, Jesse (2012). "Rosalyn Sussman Yalow (1921–2011)". Proceedings of the National Academy of Sciences of the United States of America. 109 (3): 669–670. Bibcode:2012PNAS..109..669K. doi:10.1073/pnas.1120470109. JSTOR 23077082. PMC 3271914. ^ a b c Anderson, Rebecca J. (September 2017). "Breaking Barriers: The Life and Work of Rosalyn Yalow" (PDF). The Pharmacologist. 59 (3): 152–163. ^ a b "Rosalyn Sussman Yalow". World of Microbiology and Immunology. 2003. ^ "Mildred Dresselhaus - Science Video". Vega Science Trust. Retrieved 31 August 2018. ^ Anderson, Mark (April 28, 2015). "Mildred Dresselhaus: The Queen of Carbon". IEEE Spectrum. Retrieved 31 August 2018. ^ a b Howes, Ruth H. (October 2011). "Rosalyn Sussman Yalow (1921–2011)". Physics & Society. 40 (4). ^ The Power of International Education, "Fulbright U.S. Student Program," Fulbright, accessed May 14, 2018, https://us.fulbrightonline.org/about. ^ Virginia Alexandria, "Lilly Announce New Scholars Program for 74th Annual Scientific Sessions," American Diabetes Association, last modified January 24, 2014, accessed May 16, 2018, http://www.diabetes.org/newsroom/press-releases/2014/scholars-awards.html. ^ Gairdner, "The Canada Gairdner Awards," Gairdner, accessed May 16, 2018, https://gairdner.org. ^ American College of Physicians, "Awards, Masterships and Competitions," American College of Physicians, accessed May 16, 2018, https://www.acponline.org/about-acp/awards-masterships-and-competitions. ^ U.S. Department of Veterans Affairs, "Office of Research and Development," U.S. Department of Veterans Affairs, accessed May 14, 2018, https://www.research.va.gov/services/blrd/research-awards.cfm. ^ Hays, Marguerite Hays (2010). "A historical look at the establishment of the Department of Veterans Affairs Research & Development Program" (PDF). U.S. Government Publishing Office. Department of Veterans Affairs Research & Development Program. Retrieved 2016-10-02. ^ Endocrine Society, "Awards," Endocrine Society, accessed May 16, 2018, https://www.endocrine.org/awards#!?sort=_contentstartdate. ^ American Medical Association, "The American Medical Association Awards Program Criteria," American Medical Association, accessed May 14, 2018, https://www.ama-assn.org/content/american-medical-association-ama-awards-program-criteria. ^ "American Medical Association (AMA) Award Recipients". American Medical Association. ^ Albert and Mary Lasker Foundation, "The Lasker Awards," Albert and Mary Lasker Foundation, accessed May 14, 2018, http://www.laskerfoundation.org/awards-overview/. ^ "Albert Lasker Basic Medical Research Award". Lasker Foundation. ^ Luisa Bonolis, "Research Profile: Rosalyn Yalow," Foundation Lindau Nobel Laureate Meetings, accessed May 14, 2018, http://www.mediatheque.lindau-nobel.org/research-profile/laureate-yalow. ^ "Rosalyn Sussman Yalow Nobel Prize winner for physiology or medicine". america.gov. Retrieved June 19, 2010. ^ "Rosalyn Sussman Yalow". America.gov. April 27, 2008. Retrieved June 26, 2010. ^ American Academy of Arts & Sciences, "Fellowships," American Academy of Arts & Sciences, accessed May 14, 2018, https://www.amacad.org/content/about/about.aspx?d=103. ^ "Book of Members, 1780–2010: Chapter Y" (PDF). American Academy of Arts and Sciences. Retrieved June 2, 2011. ^ Miner Roy Waldo, ed., Transactions Of The New York Academy of Sciences (n.p., 1944), 7:168, https://archive.org/stream/in.ernet.dli.2015.21502/2015.21502.Transactions-Of-The-New-York-Academy-Of-Sciences-Vol-7-1944. ^ National Science & Technology Medals Foundation, "Celebrating America's Highest Honor for Science and Technology," National Science & Technology Medals Foundation, accessed May 14, 2018, https://www.nationalmedals.org/about. Opfell, Olga S (1978). The Lady Laureates : Women Who Have Won the Nobel Prize. Metuchen, N.J & London: Scarecrow Press, Inc. pp. 224–233. ISBN 978-0810811614. Haber, Louis (1979). Women Pioneers of Science. New York: Harcourt Brace Jovanovich. ISBN 0152992022 9780152992026 Check |isbn= value: length (help). Wikimedia Commons has media related to Rosalyn Sussman Yalow.